The Ellis County Veterans Memorial was dedicated on November 11, 2000, and includes the Ennis area war dead honored at the Memorial Day Service on May 30, 1946 at 8:00 p.m. at Tabernacle Baptist Church in Ennis, Texas. The Ellis County Veterans Memorial stands in front of the Waxahachie Civic Center, 2000 Civic Center Lane, Waxahachie, Texas. Governor George W. Bush said, "This is more than just a monument; it is a history lesson for us and for future generations. It teaches that with freedom comes responsibility to earn this priceless inheritance by being good citizens, by being good parents, by living lives of decency and compassion, and by remembering that we as a nation are forever humbled by the sacrifice and service of our veterans." Photographs of the Memorial can be viewed on the Internet at "The Supreme Sacrifice." 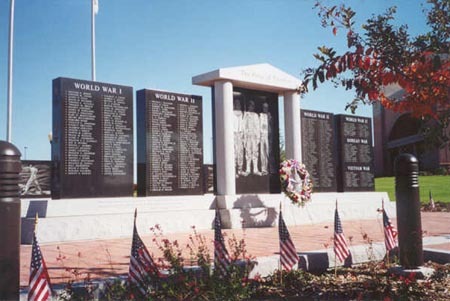 The idea for the Ellis County Veterans Memorial was born in the minds of two military history buffs from Waxahachie, who took the idea from conception to birth and organized and implemented and through hard work and determination caused the black granite tablets to be dedicated on November 11, 2000. Perry Giles, owner and manager of Giles Monument Company in Waxahachie, was responsible for research, design and construction. David Hudgins, Chief of the Waxahachie Fire Department, was responsible for raising the money for the project. All phases of the project were joined and essential for the creation of the whole, but the heart was research. First, guidelines were established to qualify a deceased service person for inclusion on the memorial. Then over the course of three-years research was persistently conducted to discover and qualify Ellis Countians who died serving their country in the 20th Century. Alex Wensowitch, from Ennis, filmed the dedication ceremony. His video and still photographs furnished by Neal White, editor of the Waxahachie Daily Light, were used by Perry Giles to create the final video of the dedication ceremony. The Waxahachie Daily Light, Ennis Daily News and Ennis Journal took active roles in the Ellis County Veterans Memorial. Perry Giles considered Alex Wensowitch his chief research assistant, and felt his efforts were invaluable to the project. David Hudgins took a weeks vacation to help Perry lay the brick pavers. The names on the Veterans Memorial are carved on black granite tablets, and listed in the order they fell. Two hundred and ninety-one names make up the list of 20th Century heroes of Ellis County. World War I claimed 66, World War II 173, Korean War 22, Vietnam War 18 and Peace Time Service 12. The first to fall in the 20th Century was Pvt. William Baker from Italy, Texas who died on January 15, 1917 while serving in Company M, 2nd Infantry, Texas National Guard. The last to fall was Information Systems Technician Seaman Timothy Lee Gauna from Ennis, who died on October 12, 2000. He was one of 17 who perished in the terrorist attack on the USS Cole while she was refueling in the port of Aden, Yemen. The Cole is the namesake of Sergeant Darrell Samuel Cole, USMCR, from Flat River (now Park Hills), Missouri, who died on February 19, 1945 in the Battle of Iwo Jima. He was posthumously awarded the Medal of Honor. ERNIE PYLE, who was killed on April 18, 1945 on le Shima, a small flat island three miles west of Okinawa in the East China Sea, wrote, "I guess it doesn't make any difference, once a man has gone. Medals and speeches and victories are nothing to them any more. They died and others lived and nobody knows why it is so." The Ellis County Veterans Memorial was made possible by the generous donations of hundreds of small contributions, and a number of large donors: Special thanks to Giles Monument Co., Bob & Sandi Shierk, Eagle Contractor Inc., Governor William P. Clements, The Waxahachie Foundation, TXI of Midlothian, Citizens National Bank Waxahachie, Holnam Texas of Midlothian, North Texas Cement of Midlothian, Bentley Ruff, Hunter Granite Co. and Jerry Camp. The picture is courtesy of Perry Giles, Giles Monument Company, Waxahachie, Texas. © 1999-2007 Utility Press Inc. All rights reserved. Copyright claim exclusive of art work.